A rumor by definition is of uncertain truth and that appears to have been the case with the early news of the M600 Vibrant Blue that had been leaked several months ago. Don’t fret too much though if you had your heart set on a Vibrant Blue release because within that rumor was obviously some truth. 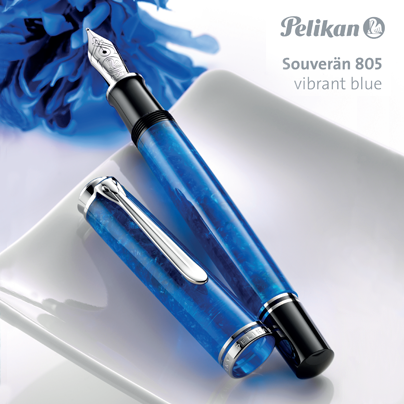 Rather than an M6xx, Pelikan has just announced the M805 Vibrant Blue slated for a February 2016 release. Described as, “bright blue with a complex structure like the sea,” it certainly has a pleasing appearance. The pen will have the standard Souverän trim which will be palladium plated in keeping with the x05 line. I think the palladium really goes well with the blue coloring and the picture seems to show some translucency to the material, similar to that of the M600 Vibrant Green. As is the new convention, this pen will include an all rhodium plated 18K nib devoid of any of the yellow gold accents seen on the other lines. Nib sizes will be available in the standard EF, F, M, and B. In addition to the fountain pen, there will also be a rollerball and ballpoint available in the same finish. The acrylic material used for this series is reported to have undergone several production steps achieve the visual effect. Pelikan has also elaborated that this is to be a special edition and not part of the regular line up so when they’re gone, they’re gone. That’s about all of the available details for now. I’m curious as to just how many New Year’s resolutions this pen is going to break. 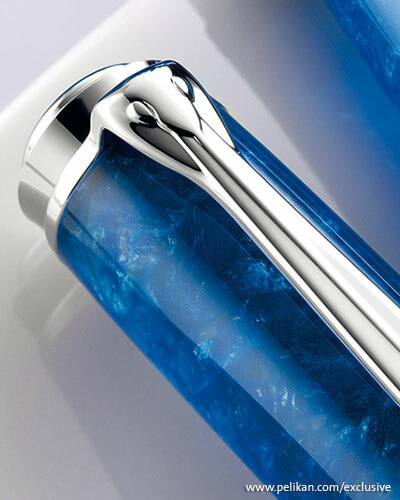 Check out the original announcement at Pelikan International’s Facebook page. While I have your attention, if the colors of pink or orange are more suited to your taste and you missed out on the initial run of the M600 Pink or M800 Burnt Orange, there is still hope. Both sold out from Pelikan within weeks of launch though some can still be found within the retail channels. Pelikan will be making a second run of both those models with availability anticipated for April of 2016. I expect that the Vibrant Blue will sell out just as quickly so don’t linger too long if you’re interested in picking one of these up. UPDATE 1/25/16: The release date has been pushed back to April 2016. I was more interested in the rumored M800 dark green sort, especially if it was anything like the GOG, but this may suffice. Thanks for posting. I really like this color scheme but I think that I might wait and see what comes later in the year. I have a feeling that Pelikan is just getting started. I’m definitely getting one. You? I’m sure one will wind up in my collection at some point but I don’t know if I’m going to be the first in line for one of these. I’m going to have to see one in person before I make up my mind. Plus, I just got the Burnt Orange which I’m really enjoying. I’m very happy that the Vibrant Blue will be a M805, it’s absolutely gorgeous. Let us hope that tortoise is coming out too – who knows, maybe the line on that rumor is not the one predicted and we get a BT M600? (One can dream). Thanks for keeping us updated on the bird news. My pleasure, as always. A new release rarely fails to be exciting and we can always hold out hope for another run of M600 Brown Tortoises. The M800 Burnt Orange grew out of a request from the US. If enough people make their voices heard on the tortoise matter, anything is possible. While I like this blue, Pelikan already did a Blue on Blue M8xx. So a bit surprising they weren’t more adventurous, especially after the enthusiasm for the burnt orange model. I agree that this bears a lot of similarity to the M800 Blue O’Blue, just with palladium trim and a bit different finish. Nothing ground breaking here to be sure but we have an entire year of releases ahead of us as well. Even if it’s in a similar vein to prior releases, I believe it will sell well for them. A new M1000 is oft requested. I haven’t heard of anything in the pipeline but perhaps Pelikan will surprise us. Next week I’ll get my M805 Vibrant Blue, can not wait to see and to write with it. Every M 800/ 05 writes perfectly, it has a good shape a long nib with a good balance. Blue is my favorite color, look into the sky and the sea and find out how beautiful this is. Writing with this pen tells you about eternity. Enjoy the Vibrant Blue. You sound very poetic about it. I don’t think that it will disappoint. My retailer told me that the Vibrant Blue already has sold out, I can imagine. It is a beautiful color and even the Pelikan M 805 is absolute one of my favorites. I like this size, it fits better and writing with this pen is like driving an automatic gear, smoothly and perfect. I would not be at all surprised to see the Vibrant Blue sell out quickly. It really stands out in a crowd and definitely catches the eye. It seems that the Vibrant Blue already sold out in most European sellers. I checked and couldn’t find one in many of the biggest players. On the other hand, most US sellers seem to have them, but at an exorbitant price (as is well known). I really hope that Pelikan releases a second batch of these ones too. No word yet on a second batch though its not unheard of as we saw that recently with a couple models. The US stock does tend to linger a bit due to the higher pricing but I’m sure that too will eventually sell out. Its a beautiful pen.